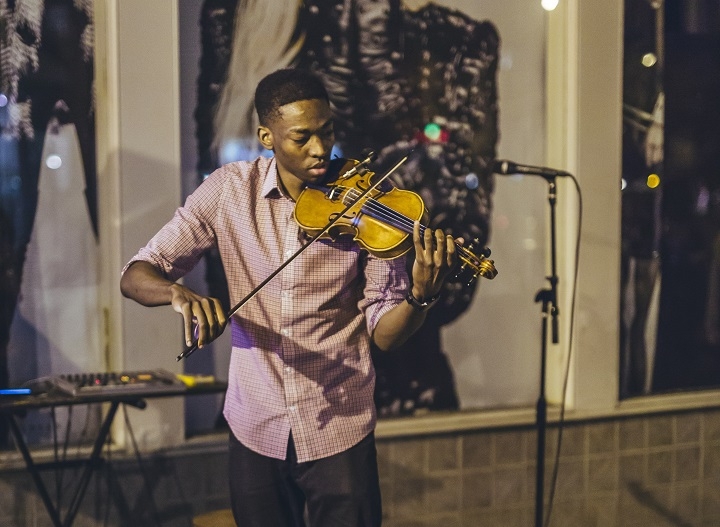 Violinist Eric Stanley has captivated fans around the world with his re-interpretation of hip hop, R&B and pop songs. With a growing catalog of originals, the VCU graduate is preparing for a tour and the release his first album. Catherine Komp has more for Virginia Currents. Learn More: Visit Eric Stanley's YouTube channel and find out about tour dates. Follow him on Facebook, where he started doing live "violin freestyles." Holding his violin like a guitar, he plucks the notes. This pizzicato melody became the backbone to “Voltaire,” a song on his self-titled EP. Eric Stanley: The song resonated with me because it just shows my journey of growing up as a musician and really seeing what’s important to people when they listen to music, which is feeling good, and being able to take something from it. Music is a regular part of life for the Stanley family. Growing up, Eric’s mom played piano and sang hymns. Sister Anhayla and brother Marcus are also accomplished musicians and the siblings often collaborate. It was at age 11 that Eric picked up the violin. Stanley: The violin just seemed right for me. It was small, I could carry it around easily. I just really liked it, the way it felt, the tone of it. But it wasn’t love at first sight. The “cool” instruments were drums and piano. And, it was hard. For the first five years, he was always last chair, the placement in the orchestra for the weakest players. Stanley: It wasn’t something I could see as a career. It was hard. Komp: What kept you motivated and pushing forward during that time? Stanley was a freshman in college when he started posting his own music videos to Youtube. With a backing track of beats, he reinvented familiar rap, R&B and pop songs. Like this one, Airplanes by B.o.B. Stanley: I spend Sunday nights, I respond to as many comments as I can. It’s something that is really powerful because every account that I see is another person, another person who may have been discouraged in the past but now they saw my video and they’re inspired again. There’s a story pinned to Stanley’s social media pages. Stanley: That was a hard story to write, it's still hard to read sometimes. It’s about when he was a freshman in high school. His mom encouraged him to go to a music camp in Maryland. Stanley didn’t want to go, he didn’t think he was good enough yet. Stanley: The hardest part about that camp, the music was difficult, but the hardest part was how I was treated by the kids because I was different, I was only the black kid there. They said black people don’t play violin. So for a long time I kept that bottled inside, I didn’t say anything to them. I never told my mom about it, but I feel like she knew something happened that day and it hurt. They threw a lot of racial slurs at me, I didn’t understand why. But as I got older I realized that it’s not their fault. But what it really did was helped me to encourage others that are in my same position, other young black males who want to play violin. Stanley has made it a life mission to be a role model, to inspire people of all ages to dream and achieve. He’s performed at more than 200 schools, and a few years ago, started the Reach for Strings Foundation to help aspiring musicians. Stanley: I’ve been fortunate to go to hundreds of schools all over the country just to talk to the kids, just to see where they’re at in their lives. And you’d be surprised, there’s a lot of kids who want to play instruments but they just don’t have anybody pushing them or the resources. So that’s where my end goal is to really have instruments to give to these kids who can’t afford them. Stanley’s talents have led to many accomplishments. He opened for rapper B.o.B and played at a conference where Bill Clinton was the keynote. He performed at the International Emmy Kids Awards and played the national anthem at a Cleveland Brown’s football game. Stanley: It was about 60,000 people and my heart was beating a hundred miles an hour (laughs). As Stanley has continued to grow as a musician, he’s also changed emotionally and spiritually. Stanley: At first I started off trying to impress, but then I realized that’s not realistic and to really help people with music it has to be from a place of love. So that’s been my transformation, my most transformative moment in my journey with violin and music. Komp: That you’re not doing it for fame or compensation but that you’re doing it to have an impact on people? Komp: And when did that happen? Stanley: Oh wow, this happened in 2015. I just broke down, I got to a point where I said there has to be more than just doing shows and traveling and awards, there has to more to music than this. I took a step back, didn’t play for a long time, just really worked on my relationship with god and focusing on building myself from the inside. Komp: For young people out there, learning violin or any new skill, what advice do you have for them? Stanley: Do not listen to people who tell you you can’t do it. A lot of times it can seem really, really difficult. It’s always the hardest things that are most rewarding, the things that take the longest, they’re the things that help the most. If you can just reach one person with your music, that’s enough. You don’t have to get a million views, you don’t have to get a whole bunch of Grammys. This is for anybody doing music, it’s not about the numbers. It’s about the impact. Stanley: It’s going to incorporate a lot of electronic elements, a lot of violin, a lot of hip hop, pop, a lot of classical elements. It’s going to be something that I can give back to a lot of my fans around the world because I know they’ve been waiting a long time and they’re still rockin’ with me.